This perennial favorite snack mix recipe is loved by everyone. There are so many variations of this idea it's hard to keep track! Actually, this recipe is the real original (I think). This is a version updated with current ingredients, especially the garlic flavored bagel chips. You can vary the ingredients as you'd like in this easy recipe. Use another type of cereal, add different nuts, or substitute nuts for all of the other snack foods. Watch this mix carefully when it's in the oven. The temperature is low so it shouldn't burn, but you never know. If anything starts to look too brown around the edges, stir it again, then take it out of the oven. Melt the butter in a large roasting pan in oven, which should take about 5 minutes. Stir in the seasoned salt, garlic salt, and onion powder. Add the two kinds of Chex cereal, the mixed nuts, pretzels, garlic flavored bagel chips, and pretzel rods, and mix until coated. 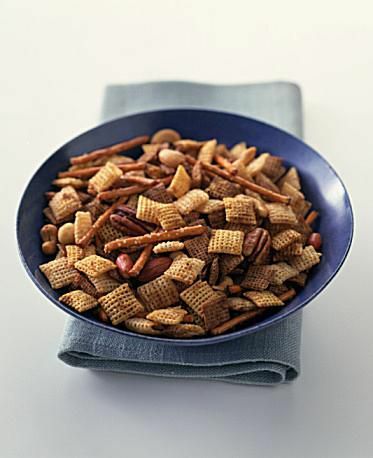 Bake the snack mix at for 1 hour, stirring every 15 minutes. Spread the mix on paper towels to cool, and when cool, store in airtight container at room temperature. Melt butter in large microwave-safe bowl on HIGH. Stir in seasonings, then remaining ingredients until coated. Microwave, uncovered, on HIGH 5-6 minutes, stirring every 2 minutes. Spread on paper towels to cool, and store in airtight container.